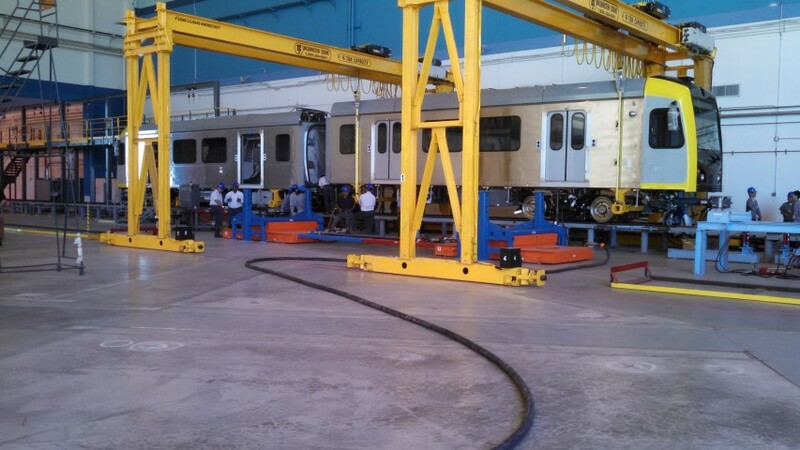 Art of Transit: New Metro Rail light rail vehicles being assembled in Palmdale. In this pic, two halves of a light rail car are being joined together. Photo: Metro. Coverage of yesterday’s groundbreaking for the Regional Connector project that will tie together the Blue, Expo and Gold Lines in downtown L.A., making for a quicker ride to and through downtown for Metro light rail passengers. Officials emphasized that the Connector will reduce the need for transfer and should hopefully make taking the train into DTLA more convenient and possibly even quicker than driving. I thought it was interesting that no one at the event noted, however, that the Pasadena Gold Line was originally intended to connect to the Blue Line. That was cut from the project in the 1990s due to budget woes, with officials figuring the subway could be used to bridge the gap between Union Station and 7th/Metro. Complicating matters, the Gold Line platform and subway platforms aren’t exactly adjacent — something I’m not sure you would appreciate unless you’re the one walking it day after day, month after month and year after year. Times architecture critic Christopher Hawthorne takes a look at the Union Station Master Plan that the Metro Board will consider in its October round of meetings (the Board delayed taking action in September). Overall, he likes many elements of the plan and considers some of the challenges — such as how new development adjacent to the station will blend in with the historic station structure. One note from Metro: officials emphasize that raising the tracks at Union Station as part of the run-through project and providing room for the concourse below would not impact nearby bridges over the Los Angeles River. A look at the “Great Streets” document released by the city of Los Angeles earlier this week. The goal of ending pedestrian deaths and all traffic fatalities in the city by 2025 is certainly commendable — and will certainly be a challenge given the size of the city and the amount of traffic within it. As the article notes, there were 80 deaths last year and that number hasn’t moved much in recent years. My humble request: improving the often lousy pedestrian environment on sidewalks near the Blue Line would be a great place to start. There have long been holistic thinkers at LADOT, but they’ve been in the minority, squeezing in opportunistic improvements in the midst of a departmental culture that prioritized car convenience. In the past half-dozen years, under the leadership of previous General Manager Jaime de la Vega and Mayor Antonio Villaraigosa, LADOT has warmed up to a broader mission that balances the needs of all road users. But today’s plan is a quantum leap forward. The document from the city is below — looks like it has some interesting facts and figures, although I haven’t had a chance to read yet in its entirety. Excellent intro to a longer series about an ongoing discussion in the city: should high-frequency bus service be the goal or should the city continue to spread bus service around so everyone has at least a little service? Transportation planner Jarrett Walker was hired to help city officials make some decisions — see his blog for more coverage. Of course, this is a hugely relevant conversation in Los Angeles County, where Metro and many other municipal agencies provide bus service. Some of it is certainly high frequency (at times) and much of it dives deeply into the ‘burbs and has low ridership but is obviously critical for the mobility of those who do ride. The catch: funding for bus service is never unlimited, meaning that to some degree the number of high-ridership, high-frequency lines are limited by the number of low-frequency bus lines. The LADOT strategic plan doesn’t just call for “ending pedestrian deaths” but actually ALL L.A. traffic fatalities – by 2025. Based on Vision Zero successes in Europe this is very possible. What’s more important: more safety or more capacity for cars? Thanks for clarification; I’ll fix in the post. I also added link to Streetsblog’s excellent story. Sorry I overlooked that. I’ll take more capability for cars any day. We are not Europe so who really cares what they have achieved over there. As the LA Times story makes clear, the new LA Union Station master plan overwhelms the station building itself. It is reduced to a mock Disney-like show station. The project’s “footprint” reminds me of the big cartoon foot that used to crush the opening sequence of Monty Python’s Flying Circus. However, mega projects make for mega METRO career$, juicy con$truction contract$ and union job$. So, I imagine when the Union Station project is hoisted up the imaginary flagpole at tomorrow’s METRO board meeting everyone will salute. I am happy to see that the Mozaic Apartments will be leveled in the new plan, although, as the Times pointed out, the unfortunate METRO Building (aka the Taj Mahal) will remain. One suggestion, I would move cautiously with this project and wait until the future of the CA High Speed Train is clear. If it’s built I predict that it will be an equal player at Union Station and will need much better integration with the scheme. It is currently scheduled to be “hoisted up” the flagopole at the Oct. 23 Board meeting. Metro Board Member Diane DuBois asked for postponement to get answers to some questions involving the near-term parts of the plan. Congrats to Metro for officially breaking ground on this rail project. Los Angeles will benefit from having more mass transit in the 21st Century. New York (where I’m from) has one of the world’s largest rail systems because over a hundred years ago, the Big Apple was aggressive in building a subway network to serve as many people as possible. The City of Angels is taking a page from the NYC Playbook. By the way, the LA Times link is incorrect. Can you please correct this? Thanks. My opinion is that every Metro rail station should be rebuilt similar to Union Station: a multi-use complex that does a lot more than just being an empty, desolate station that attracts criminals and the homeless. Stations needs restaurants, fast food outlets, convenience stores, pharmacies, newsstands, something like an airport terminal. I think your characterization of every station being empty and attracting criminals and the homeless is inaccurate and just something you made up. Agreed, the HP and SP stations on the Gold line are well situated and integrated to the communities with easy access to food and drink. There are farmers’ markets there routinely. The Filmore station is right next to many establishments. There is no need to compete with them. So we have a Metro spokesman saying Metro is safe, and on the other hand, Metro annoucements saying people should take precaution when riding Metro. Charlie, I can’t believe you would state something like that. You’re arguing that Metro shouldn’t ask people to be safe because that automatically means the entire system is unsafe and is filled with criminals?! What’s wrong with promoting safety on Metro? Promoting safety does not mean you’re claiming the whole system is unsafe. It’s a large transit system that serves millions – of course it will be somewhat of a crime/terrorist target, albeit not on the same level as London or New York (with much larger and more crowded systems). If you are a regular rider, you know that crime rates on Metro are similar to the surrounding areas in general. No more or less. I’ve ridden the rail system for 7 years now and have yet to see any criminal act on the trains or in the stations (other than people not using their TAP cards or using the emergency exit improperly). Repeat it many times, the people become reliant on the nanny state to protect them when people are perfectly capable of protecting themselves. They expect the police to magically appear when the need arises. I’m more than aware that the police cannot be everywhere at all times nor do they have teleporting powers, so that’s why I carry pepper spray on me at all times. There you go again Steve, taking a legitimate, if inaccurate, statement from a citizen/taxpayer and ridiculing him–“just something you made up.” Who is paying you Steve–METRO? If so, that citizen and every citizen is in fact paying you and is entitled to be answered in a civil manner–even, dare I say, if the question does not seem civil to you. If a citizen’s impression is that all METRO’s stations are unsafe, then that is his reality and METRO has a credibility problem, because perception in politics–and METRO is political if nothing else–is reality. If people make things up or post things that are grossly inaccurate, then I’m going to say so. We have a long history of being civil here, but we also have a few people who post things in order to provoke or instigate. About a quarter century ago, people were saying that nobody in their right mind would want to ride a trolley that went from Downtown Long Beach to Downtown Los Angeles, passing through Watts and Compton in the process. They said it would be plagued by constant crime from drug dealing to gang violence. They also said that it would be cheaper to pay every potential rider to drive the freeways, than it would be to actually run it. Then the Blue Line opened for revenue service. It quickly became one of the most popular urban rail lines in the country, packed to standing room only during peak periods. It soon became apparent that every station platform from Pacific to 7th/Metro and back to 1st St had to be lengthened to accommodate 3-car trains, because there were so many people wanting to ride it. During the Los Angeles Riots, Metro Rail trains and stations were among the safest public places in the whole county. In a quarter century of riding Metro Rail to concerts, museums, and the occasional weekend job in Los Angeles County, I’ve had my life threatened exactly once (and the motorman put a very quick end to that situation). By contrast, it’s rare that more than two months of driving go by without my getting into a situation where I felt like I was taking my life in my hands. Once in a quarter century vs. several times a year? I like the odds on Metro a lot better than on the streets and freeways. I’m not one normally given to making ad hominem attacks (and neither, I would say, is Mr. Hymon), but if there is a perception of Metro Rail being unsafe, then it’s most likely because somebody is either very easy to frighten, or is deliberately spreading that perception. WAY TO GO STEVE Some people have to think before they type. .
About the Gold Line to Red Line link at Union Station, why wasn’t the elevator on the Gold Line platform built to travel another story down to service the Red Line subway platform? And if this link can be created, whats so hard about creating a direct stairway/escalator well from the Gold Line platform to the Red Line subway platform? Union Station is the only place where two Metro Rail lines intersect, yet aren’t directly connected. You need to walk from the Gold Line platform into the Union Station railway concourse from which you have to walk to either side of the Red Line subway entrance in order to make your way onto the Red Line subway platform. Bad planning to say the least. That’s exactly what I think. Metro should link all rail and transitway stations directly. When passengers are making transfer, they can go directly from platform of line A to platform of line B, without exiting the station of line A and entering station of line B. The fare should be based on distant with free transfers between lines. With TAP card in service, this should be an easy task: just let passengers tap in and tap out. In a sprawling metropolis like LA, it’s not quite realistic to create one-ride transit lines; Metro should focus on how to make transfer between rail/transitway lines easier. If Metro wants the rail or transitway lines to travel faster, it should invest money on grade separation at design stage rather than creating new direct-link lines like Regional connector. “Funding is never unlimited”, it’s good that we know what kind of reality we are facing. But what should we do to deal with this reality? I think we should focus more on how to utilize what we already have in a more efficient way, rather than just creating new services. For example, if the a local bus line becomes slower and slower, then we should focus on how to make the local bus travel faster, rather than adding a new rapid line on the corridor. Things we could do include spacing out the bus stops (we don’t need bus stop for every 0.1 miles, how about spacing the distance between stops to every 0.2 – 0.25 miles), relocating bus stop to the further side of traffic signal, making the bus zone longer so it’s easier for the bus to pull out from bus stop (eliminate street parking space is not only good for public transport, it’s also good for cyclists), and changing the fare system to discourage cash usage and encourage TAP card usage. Have all the lawsuits been settled regarding the regional connector ? The court has thus far largely ruled in Metro’s favor in the lawsuits but the plaintiffs still may decide to appeal. Yes, direct pedestrian connection from the Gold Line to the Red/Purple lines is a must ; however, extending the pre-existing elevator shaft down to the subway l;evel would be in impossibility because the inbound track would be directly compromised. Extending the Gold Line platform just a few feet to the north and installing an escalator/elevator/stairway combo would make much more sense, since no undertground tracks would be blocked.